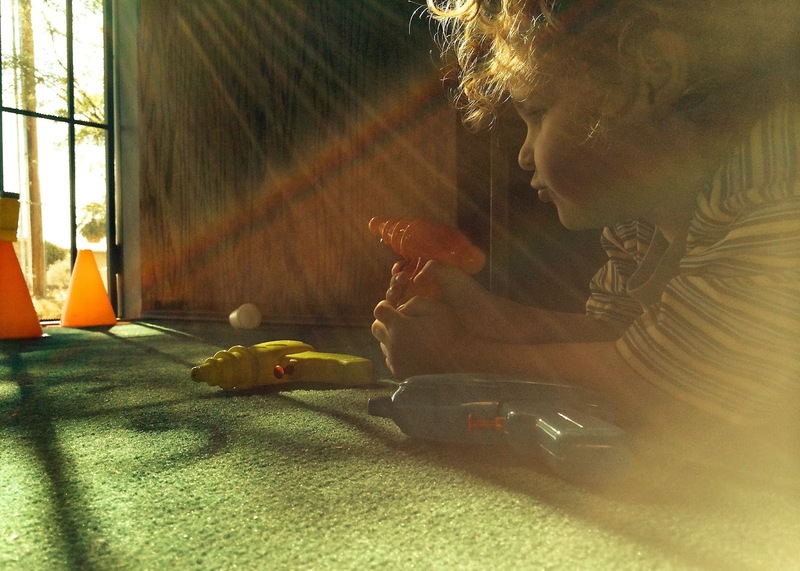 Check out this lively discussion on sharing your photos online. We discuss apps, services and philosophies along with tips for integrating them with your photo sharing needs. Yesss!! 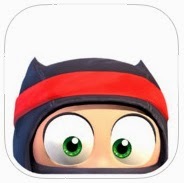 Clumsy Ninja is finally out! I have been looking forward to this game! Are you playing it yet? Download it FREE here! This was another fun Hangout On Air with the Smartphone Photographers Community. If you click this link it will take you to the part where we discuss my "Butterfly Kiss" photo at the 36 minute mark. (Otherwise watch the show from the start below.) I had fun talking discussing this photo and the other suggestions that were made sound like another cool challenge for me to try! I really enjoyed learning about High-key photography technique from Michael Sweeney and I'm looking forward to trying out the effect. What do you think of smartphone photography? Come join us sometime. Here is the "Butterfly Kisses" image I posted. I have several more eye images I'm working on and I'll post more once I process them. You have heard of a butterfly kiss, right? Children remind us of what is simple and most important in life: have fun, the rest will follow. A play on words and a play on, well, play. There is this awkward time on certain days of the week in between errands and appointments, specifically about an hour before I need to go pick up Lucian from school where it's not enough time to nap or really go anywhere, so on this beautiful fall day, Keagan and I got on the floor to play. We had some little squirt guns that had been gifted to the boys over the summer. Normally I don't allow them in the house, but Keagan was being impossibly cute with the asking so I caved. I figured I could at least have some fun with it if I set some ground rules about where he was allowed to squirt the water. I set up some little targets for him to aim at and as I was showing him how to shoot the targets, the sun was coming through with such intensity so, I decided to do some shooting of my own with my iPhone 5s — also my idea of a good time. I was able to catch a rainbow AND lens flare in one shot and I'm really pleased with the results. The only editing I did was in iPhoto; just some cropping and a little bit of bumping up the contrast on this first shot. I played with some other effects in the other two shots as the challenge was all that sunlight with which to work. I love all of the elements in this shot: lines, curves, curls, shadows, rainbows, sun rays, color, highlights, the way my son's little lips are formed while he's making little sounds or thinking about where to aim. 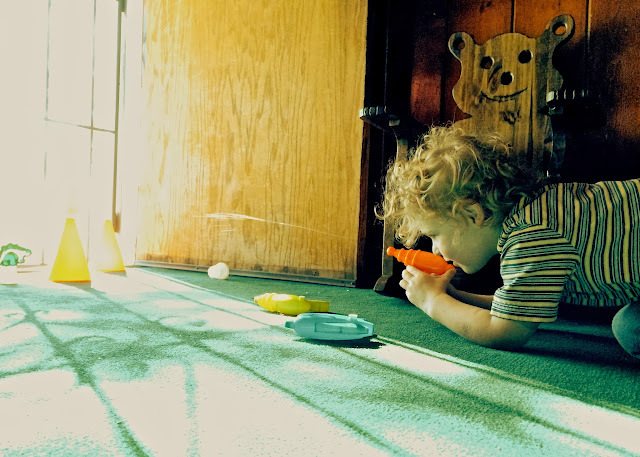 At this time I am reminded of a newspaper clipping photo I once saw of my Grandfather as a middle school-aged child shooting a rifle at target practice during a class. I believe he was in some type of rotary gun club at school in the 1930s. Upon seeing that photo is was no wonder he later became a sharpshooter for the military during WWII. It's hard to imagine that there was ever a time when guns were in schools as a source of education if perhaps some sort of early military inculcation. 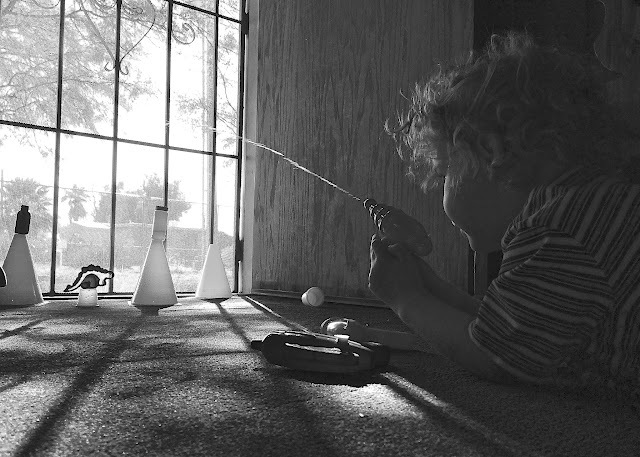 This day, however, I chose to set those negative thoughts aside in order to have some simple fun with my son and some plastic toys that shoot water. He is innocent and unaware, just having a good time knocking little bottles and medicine cups off of triangles with water and studying the trajectory. I am not innocent, but somehow I managed to have fun with this time all the same. I have been using this app for a couple of years now and I really love where it is headed. This parenting tool is incredibly versatile with amazing attention to detail. The developer truly cares. The most recent update really looks great with iOS 7. I really appreciate how the developer keeps on making improvements and he's also really receptive to feedback! Those are important qualities to me when deciding where to invest mine and my family's time and attention to an app such as this. • Customizable sounds would make this a 10-★ app! • I wish I could make the sad face sound ☹ a little louder and the cha-ching sound a tad softer and have different sounds for stars, checks, coins or time. I just think it would help. (Think Pavlov.) It's the sounds that I find the most cumbersome yet. For example, I know I could just turn the sounds off or mute the loud sounds in the app's settings, but it doesn't seem to respond yet. (bug?) I like the audible feedback, I just wish it wasn't so loud. Sometimes I forget to turn the volume back up after using this app and then my alarm goes off and I barely hear it. I'm sure this could be tweaked in another update sometime or maybe I just need to use it differently; or maybe the Dev has something up his sleeve? It's quite possible! 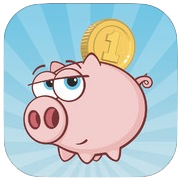 • This app is universal and looks great on all iOS devices. It is still supported on an iPhone 3GS running iOS 6 which is what my littlest learner is using. • Try before you buy: there is a lite version and a full version along with incremental in-app purchases so you can really make it fit the needs of your family. An app that grows with you — imagine that! • I use most all of the banking features and my Second Grader has a pretty clear picture of his total net worth right now — which is more than I can say for many college grads! (self included) He enjoys looking at the pie chart and we also show him his savings account where his Birthday and Christmas checks get deposited along with Gift Certificate balances. I use my iPhone and iPad for all of our banking, which includes snapping photos to deposit checks, so both my boys can see the entire banking process. 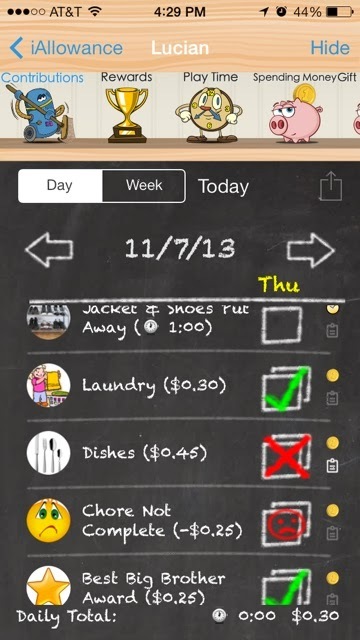 • I recently started filling out the description section of individual "chores" in addition to using pictures. This is great because the 4-year old can "read" each item by looking at its picture icon (which you can choose your own or select from an in-app picture bank) and the 7-year old can practice his literacy skills by reading the descriptions I enter. This cuts down on the "but wah, you didn't tell me I had to do xyz." • Pro-Tip: view this app on your Apple TV via AirPlay and it's a great way for the whole family to become involved with household contributions. Sometimes we ask our 7-year old to review his iAllowance on the big TV and then we discuss money, transactions and things he wants added to his rewards list together. • Reliable syncing is absolutely crucial if you're an iFamily. It works best when children are made accountable for their own input and then parents have the ability to approve that input with feedback despite which device it's queued up on. Parents who work different shifts or even a babysitter will see the value in this feature alone! • Bottom line, you get out of this app what you put into it. It can be overwhelming in the beginning, but investing the time to populate and customize it is worth it. If you're consistent and diligent, you'll definitely see results by using this fantastic tool! Download it or gift it today! Disclaimer: I was gifted the full version of this app by the developer for the purposes of a review but no other compensation has influenced any personal bias in favor of reviewing this software. Join my comrades and I for an informative discussion on smartphone photography tips.